This is one of those wines you pass around your Sunday dinner table with friends, family, a roast chicken and the fear of embarrassment as you open the last of the six pack you purchased just as you’re clearing the table for cheese (the real drinking starts with the cheese as I’m sure you all know) and now you’re out of wine. Some bottles just go down that easy. The Domaine Dupeuble has been around for 500+ years as a continuously functioning winery. The name has changed a couple of times and the first Dupeuble to put their name on the shingle was Jules when he married the heiress to the property in 1919. Today, grandson Damien is in charge with his entire family involved in operations of this now 100 hectare property, 40% of it devoted to vines. Kermit Lynch, éminence grise of American importers, discovered these wines in the late 1980’s and a great relationship was forged. One that brought these wines to our shores for the first time. The domaine is situated deep in the south of the Beaujolais AOC in the hamlet of Le Breuil. This is the southern half of Beaujolais, meaning everything south of the town of Villefranche-sur-Saone, and known for the light, fruity qualities of its wines. This is also the area known as the Bas Beaujolais, a terroir known for its flatter terrain and rich, sandstone and clay based soils. The majority of the Domaine Dupeuble is planted instead on granite soils with a bit of limestone, both types of rock the key to quality in the northern Beaujolais where the famous crus are located. This is what sets these wines apart. Being staunch advocates of sustainable farming, there is no use of chemical pesticides or synthetic fertilizers. Fruit is harvested manually, fermentation done on natural yeast, no sulfur, no chaptalization, no new oak, no filtration. Real, honest wine and it’s clear from the first sip. The 2012 vintage was a tough one as you may have already heard, especially if you read these emails, but conscientious producers like Dupeuble were able to take advantage of the fact that the fruit they did harvest was of superlative quality. It just took an extraordinary level of attention to detail. The 2012 Dupeuble Beaujolais from first nose performs way beyond its humble pedigree. A beautiful bouquet of cherries, cranberry, smoke and violet is anything but subtle. Pure and sappy mid-palate, medium bodied and fantastic balance, just a touch of the tannin of the vintage, excellent length and grip. And all of 12.5% alcohol according to the label. After consuming a bottle or two, I’d say it’s actually just a bit lower than that. I’d also compare this to a classic Chambolle-Musigny but at $14.99 I think I’d sound a bit cheeky. So I won’t. In any event, this is the best red wine I’ve ever offered at this price point and it happens to be in decent supply so I’ll also refrain from badgering you to stock up (but you really should get your hands on some). 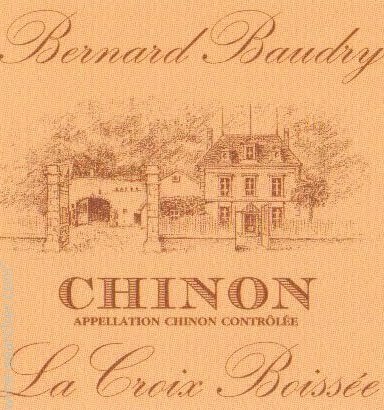 There's not much more one can say about press darling Domaine Baudry, and its reference standard Chinons, that hasn't already been written. For my part, easily the best producer in Chinon and, along with Clos Rougeard, the best source of Cabernet Franc in the Loire Valley. Starting with just a couple of hectares of vines in the 1970's from family holdings, Bernard Baudry has grown the domaine to its current size of 25 hectares. Soil types in the Loire Valley have everything to with the Loire itself with vineyard sites close to the river being alluvial in origin meaning gravel and some silica and hillsides being mainly clay; the former typically producing lighter, more elegant wines and the hillsides more substantial examples. The very best terroirs tend to be the tops of the hills where pure, chalky limestone is found close to or at the surface with shallow clay topsoil. This is the source of the Croix Boissée, Baudry's rarest and best cuvée. The Croix Boissée, one of five distinctly different Cabernet Francs produced here, comes from a 2.5 hectare parcel with a full south exposition. Farming is organic, yields are very low and élevage is done in old wood, 18 months in this case. The structured nature of this cuvée requires extended barrel aging and the result is a pure, structured and complex wine. The 2011 vintage in the Loire wasn't an ideal one. A promising, dry and warm spring gave way to a cold, damp summer. Vineyards near the river needed lots of tlc with the threat of rot a constant issue. Most growers harvested by mid-September, just as the weather was turning warm and sunny, before rot could really set in. Hilltop parcels like the Croix Boissée have the advantage of good drainage and ventilation and were able to take advantage of a couple of extra weeks of warm, dry weather. The result is a classic Chinon of the highest order. The 2011 La Croix Boissée is a stunner. Reminscent of the 2005, the 2011 reveals the warmth of the harvest with lush fruit and gorgeous aromatics. Classic Cab Franc structure holds it all together. Deep purple color. Pretty notes of flowers, tobacco and minerals on the nose with mineral-charged black and blue fruit flavors. One of the few remaining wines you can buy anywhere near this good for the price. Most Nebbiolo fanatics I know, myself included, were introduced to the varietal via a bottle of Barolo or Barbaresco, its two most famous sources. I distinctly remember an uncle of mine carefully and reverently decanting a bottle one Sunday afternoon before an early winter dinner in Naples many years ago, all the while explaining why this was such an important wine. If i recall correctly, it was a good vintage of Giacosa Barbaresco and both the wine and I were about 18 years old. One thing I’m sure of was that it was the most interesting thing, food or wine, that I’d ever smelled. In fact, the entire dining room was quickly perfumed by this wine. I’d only had inexpensive (inoffensive if we were lucky) local wines by that point in my life and this was truly exciting. it was also the most powerful wine I’d ever drunk and a couple of glasses later I was probably slurring my words. Unfortunately, wines like that are becoming scarce due to demand for high quality traditional Nebbiolo and, rather paradoxically, by the fact that more and more producers are making less and less traditional renditions of Nebbiolo in most areas of Piedmont. I’ve yet to come across an aged “modernista” bottling of Nebbiolo that displayed anywhere near the elegance or perfume of the traditional examples which is why I don’t typically buy or sell them. No need to name names. Gattinara is a small town and winemaking zone in northern Piedmont’s Sesia Valley, an area which descends from the glaciers of Monte Rosa, the second highest peak in the alps. An area famous for it’s textile industry, viticulture was much more important here before phylloxera decimated the vineyards. With higher paying jobs in factories and textile mills in nearby Novara and Milan luring workers away, there wasn’t much of an incentive to replant and as a consequence, the area of land planted to vines dropped from 100,000 acres to roughly 3,000 where it stands today. Vine for vine, this tiny area more than makes up for quantity with with both style and quality. These wine aren’t merely good, less expensive alternatives to Barbaresco and Barolo, the best are worthy rivals. The Antoniolo family owns roughly 40 of those acres in Gattinara, the jewel in the crown amongst the myriad Nebbiolo growing areas of these hills, and the 3rd generation of Antoniolos are now in charge. The 2008 vintage was a classic one in Piedmont with a healthy Nebbiolo crop producing wines generous in both body and structure. The Antoniolo Gattinara is a reference standard wine with all of the complexity, elegance and power of great Nebbiolo along with the pronounced minerality and fine tannins this zone is known for. Notes of violet, raspberries spice and almonds with fresh red fruit flavors. Medium to full bodied and strong, finely tannic finish. For one of the worlds great wines, Chablis gets very little respect these days in the grand scheme of things. It is white Burgundy after all, more geologically than geographically being closer to Champagne than the Côte d'Or, but the name Chablis doesn't carry as much weight as Meursault or Puligny-Montrachet, for example. This wasn't the case some decades ago when California vintners, and many others worldwide, made wines with names like "Pink Blush Chablis" along with their ersatz "Champagne". It was a famous wine back then whose name was synonomous with quality. Talk about counterfeits. Recent legislation has cleared up most of those issues but the damage has clearly been done with a couple of generations of wine drinkers growing up knowing Chablis only as that headache-inducing, slightly sweet white that came in a jug with a little ring handle. While still a fairly difficult wine to find anywhere but specialized retailers of imports, Chablis’ popularity has been growing rapidly over the last decade or so, due in no small part to the efforts of a handful of conscientious growers and importers beating the bushes for great values. Lots of love from high profile wine critics doesn’t hurt either. The Picq family has farmed vineyards in Chablis for generations and the Gilbert Picq domaine, named for its since retired founder, is now being run by sons Didier and Pascal Picq. 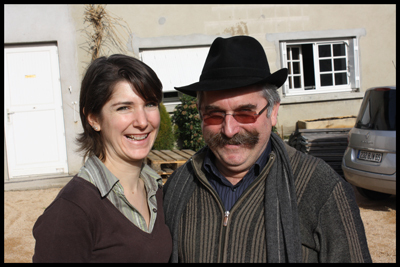 Didier is in charge of winemaking and Pascal manages the vineyards while their sister manages the office. A true family domaine. Farming here is done according to the principles of lutte raisonée, literally“reasoned battle” in French (best translated as supervised control oin Englidh). This is a very pragmatic approach to farming where treatments are applied only when absolutely necessary and biodiversity is encouraged in the vineyards to help create balance and natural protection for the vines to decrease the need for such treatments. It’s really a happy medium between convention and the strict requirements for organic certification. Severe pruning and spring de-budding help keep yields down; a necessary first step in making great Burgundy. In the cellar, all wines are fermented on native yeasts and both fermentation and aging take place only in stainless steel. The Dessus le Carriére vineyard, meaning above the quarry, is comprised of two parcels planted in the 1970’s on a huge slab of pure limestone with a thin layer of Kimmeridgian clay and limestone shards above. This is the rock that defines the unique Chablisienne expression of great Chardonnay; wines of depth with racy acidity, powerful minerality and purity of fruit. These two parcels are the first to be harvested and the last to be bottled chez Picq. Even later than the 1er Crus. This particular cuvée has well deserved reputation for being a wine that performs above and beyond its humble AC Chablis village appellation. Flowers, citrus and spice on the nose with subtle stone fruit and Granny Smith apple flavors and a finish of racy minerality. Always the most delicate wine in the cellar, the 2011 is particularly transparent. It is perhaps not coincidental that these wines, which I have often characterized asamong the finest values in Chablis (and which regularly make my own shipping list) are also grown and crafted by someone who I've come to recognize as among the most humbly down-to-earth, affable and enthusiastic (yet immune to hyperbole) of vignerons [ie. Didier Picq]. David Schildknecht, The Wine Advocate, issue 2008, August 2013.